We started Bossa's agility log as soon as she entered Excellent because we have found these logs to be a useful training aid. On December 21, 2014, Bossa earned her Excellent Jumpers title. Just over two years later, on January 22, 2017, Bossa earned her first MACH. On January 18, 2019, she earned MACH2. 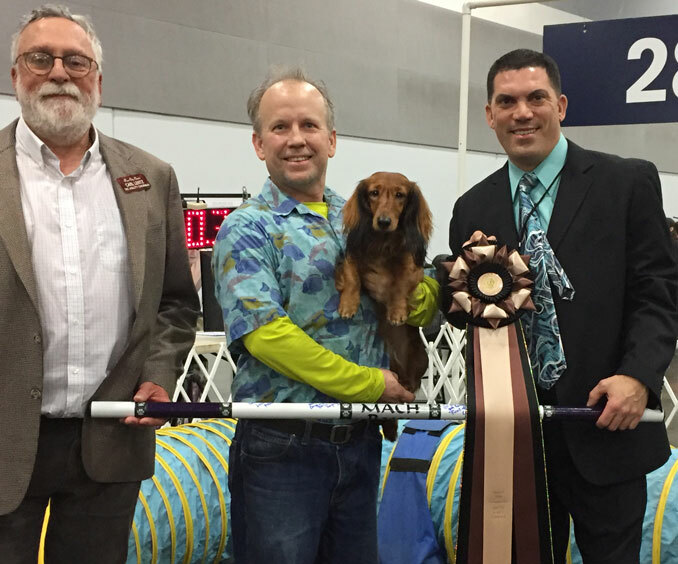 This is a record of all of Bossa's runs in AKC Masters agility. Olive is running the same courses at 4". Click here for Olive's runs. Bossa has 2588 championship points and 44 double Qs. A dog requires 750 championship points and 20 double Qs to receive the MACH title. Indoors on dirt 33.98 (SCT 49) A really nice, smooth performance in the jumpers ring. Very little wasted line. Dan Butcher 45.54 (SCT 76) Another course with a lot of opportunities to make up time with a tight line. Good contacts and table. Dan Butcher A really solid set of runs this weekend. We were in sync and Bossa ran tight lines. Indoors on dirt 36.89 (SCT 51) A very twisty course with several challenging sections. Not the tightest line, and she slowed down along the back wall (loose footing). Dan Butcher 44.98 (SCT 74) A twisty course with some technical challenges. Lots of dogs having trouble missing jumps. Great line, good contacts, good table. Dan Butcher After two weeks off while Bossa was in season, it was nice to get back in the Qs. Indoors on dirt 32.99 (SCT 47) Bossa had a really hard time in the weaves, almost sliding past pole 3, but adjusted her pace and turned in a nice performance. Lori Holdren 49.55 (SCT 74) Nice solid performance, good contacts, fast table. A little unsure of footing at the start but a nice run. Marianne Diehl A good pair of runs after a longer stretch off than planned (everything from work to weather). Indoors on mats 31.52 (SCT 47) With the pressure of the MACH hunt off, ran this course to really smoke it. Second place was five seconds back! Dale Mahoney 50.99 (SCT 73) Big crowds around the ring but Bossa wasn't phased. Great contacts, but even slower getting on the table. Not sure why... keep an eye on that. Dale Mahoney A more relaxed pair of runs - handled the JWW course to win and had a great line. Indoors on mats 37.58 (SCT 50) I think our slow time was mostly due to me babysitting every obstacle - Bossa was running wide at each turn. Dale Mahoney 50.28 (SCT 73) A nice professional run on a somewhat tricky course. Good jumping, a little slow getting on table. Dale Mahoney The crowds didn't bother Bossa as she earned MACH2 - she led the way on her victory lap and looked so proud! Indoors on dirt 33.36 (SCT 48) A twisty course and we were really in sync the entire way. Great line, clean jumping. Jan Skurzinski 48.52 (SCT 76) Bossa wasn't a big fan of the start (sort of a sling to the dog walk) but after that she got moving. Great contacts, table, and weaves. Jan Skurzinski A really nice performance. Footing wasn't always the best, and I think that was reflected in the times. Indoors on dirt 32.04 (SCT 50) Bossa almost pushed off the jump three from the end (too much pressure for a rear cross without any verbal support) but we corrected and she got the Q.
Marianne Diehl 42.99 (SCT 75) Really great lines through a couple of twisty sections gave us a huge time advantage. Super contacts and table. Todd Buchla Bossa's jumping was great, and she was driven (no class this week). Nice to feel in sync again. Indoors on dirt 37.55 (SCT 50) After an early take off and dropping the first bar HARD, Bossa was very careful with her jumping. A nice run aside from the F.
Robin Veenema 46.89 (SCT 73) We finally got our act together in the standard ring, running a pretty tight line with great contacts. Jim Primmer Jumpers started with a tunnel and Bossa mis-judged the take off of the first jump. Keep an eye on this. Indoors on dirt 34.83 (SCT 48) Not the tightest line, particularly in the closing sequence. Probably lost a second +, which would have put us in the fight for first. Jim Primmer 51.03 (SCT 73) A great run but I made a poor choice on how to handle the closing sequence and we ended up with a runout at the final tunnel. Keep it simple, John. Robin Veenema Poor course planning cost us the Q on the Standard course. I was debating between two approaches and chose a loser. Indoors on dirt 32.29 (SCT 49) Really fast, really clean, tight line and great weaves. Really nice run to finish up the weekend. Debby Wheeler 49.78 (SCT 75) A really awesome run, with great contacts and table. Got a little out of position near the end and ended up trying a rear on the flat which Bossa read as a push to the backside. Art Brest Nothing to complain about here - I just got caught too far ahead for a rear cross and too close for a blind on the standard course. Indoors on dirt 35.25 (SCT 49) A fairly straight-forward course for Bossa's stride length. Bossa's jumping looked good. Debby Wheeler 49.97 (SCT 71) Badly timed reverse spin led to a back jump, later a refusal and knocked bar as well. Not the prettiest run, all around. More bad handling than Bossa's fault. Art Brest A lot going on with the puppies, but we should still have been able to turn in a double Q.
Indoors on dirt 42.69 (SCT 53) Bossa fell inside the opening tunnel and took a while to get up to speed again. A tricky course but we played it safe for the double Q.
Gillian Crawford 49.69 (SCT 76) First run in a long time (Bossa whelped five puppies in August), great contacts and jumping even though we were both a little rusty. Art Brest We were both really happy to be back in the ring after a long break. Outdoors on grass 35.95 (SCT 51) Bossa felt slow to me, but obviously was running just fine. She really likes this surface. Good, solid run, tight line. Jan Chamberlain 48.73 (SCT 76) Bossa's eighth ring performance of the weekend (with Rally and Obedience), and she was looking a little frazzled but still had great focus and good contacts. Jan Chamberlain Nice to see everything come together again! Bossa also earned her Rally Intermediate title. Outdoors on grass Right after jump one, Bossa takes a sharp 90 degree turn, cuts behind me, and takes a wrong course. She knocked the bar, wouldn't come back to me, so I picked her up. Jan Chamberlain 49.45 (SCT 71) After that start in jumpers I was worried about how Bossa would run in Standard. Thankfully she was game. Saved a near back jump late on the course. Indoors on dirt We decided to call it a day after Bossa's concentration lapses in the standard ring. 58.67 (SCT 76) Bossa curved away from the weaves on a tire-weave start, and later ignored me to take the wrong tunnel entrance. Good contacts though. Gillian Crawford Not really clear where Bossa's head was on this course, but she was blowing me off! Indoors on dirt 37.69 (SCT 54) Not quite as tight a line as we had on the standard course (Diane says I wasn't talking to her as much), but still a nice run. Rattled one bar, but it stayed up. Geoff Teare 44.00 (SCT 72) Bossa was fired up for her first run in ages, but was solid on the contacts and table, great weaves, and very tight line. Danielle LaGrave Nice to get back to running after time off for travel. Indoors on dirt Bossa's first trip to the AKC NAC was a good one, although not perfect. She dropped the closing spread on the second course both Friday and Saturday. I suspect a combination of the altitude and her weight (carrying a little more in anticipation of breeding her) was affecting her stamina. Still, her runs were solid and she seemed to enjoy the environment. Ultimate placement was around the middle of the pack - 39 out of about 80 entries. Indoors on carpet 35.03 (SCT 51) I think Bossa is starting to like it here. :) Well controlled weaves, good jumping, and some complex side changes. After the run, I took her for a walk around the ring to meet her fans. Susan Leitner 48.15 (SCT 74) We really seemed in sync on the standard course. No drama, just a good line and solid obstacle performance. Bossa seems to like the crowds at ring side, and doesn't mind all the activity around the hall. Susan Leitner I hope we get to come back in the future. After her first run, Bossa really understood the surface and jumped great. Indoors on carpet 33.51 (SCT 49) It didn't take Bossa long to find her stride on this surface, although she still has to fight for the weaves. Nice run (with a little improvisation when she sped up more than I expected early). Susan Leitner 50.49 (SCT 75) A little wide at points as Bossa tried to figure out the surface, and a little hesitation at the table (in a corner with LOTS of spectators). Impressive run. Susan Leitner This is the first time our schedule allowed us to show here. Bossa earned her BN title between runs. :) Good work Bossa and Diane! Indoors on dirt We're looking for double Qs these days, and since it would be a long wait until the jumpers run, we headed home early. Carole Lynn Evans N/T (SCT ??) Jump 5 was a wingless jump with a 180 turn. Bossa started my way ("dig") but then turned away. She was behind the bar, I was out of position to save, and she backed jumped. Later wouldn't get on table. Picked her up. Lisa Potts Can't tell from the tape what went wrong. Could tell that there was a loud sheltie just outside the gate barking its head off. Indoors on dirt 33.72 (SCT 49) Nice tight line, even though Bossa was being careful with the jumping. She was flying into the weaves and just lifted her head a little to slow for the entry. Lisa Potts 46.51 (SCT 72) A slight hesitation onto the table, and a little wide at a few points, but great contacts and a nice performance. Carole Lynn Evans Good communications between us (talking more on course). Indoors on dirt 33.06 (SCT 46) Bossa just doesn't trust the surface in this ring, and was running slow but careful. Not pretty, because I was afraid to race her so was stuck with rear crosses on a slow dog. Zach Davis 45.39 (SCT 70) A little wide at one turn (I was late getting into position), but otherwise a nice run. Good contacts, nice jumping. LaVar Griffin We had to fight a bit for the Jumpers Q, but it was nice to see both of us wanting it. Nice runs for Bossa. Indoors on dirt 39.59 (SCT 50) A nice run with a fairly tight line, but for some reason Bossa entered the weaves on the wrong side. Even she seemed surprised - redid the weaves. Marianne Diehl 50.55 (SCT 75) The footing was really bad through one jump sequence and Bossa slowed up to deal with it. Otherwise a nice, smooth run. Terry LeClair So close to a double Q, but not to be. It looks like there was a window back-lighting the weaves, the only thing I can see as a possible cause. Indoors on mats 33.71 (SCT 43) Fourth run of the day, and again running slower. Elwood the dachshund beat us by about 1/2 second. Diane Fyfe N/T (SCT 69) A decent start but popped out of the weaves at pole 6, and again at pole 8 on the retry. Picked her up. Debby Wheeler Another T2B Q in the jumpers ring (although wide at every turn), and an NQ (wrong course and blew a hard weave entry) in Premier Standard. Indoors on mats 32.18 (SCT 48) After that meltdown in standard it was nice to have a tight, clean run. Debby Wheeler 56.81 (SCT 69) Bossa was looking good early on, but then ran out the A-frame. I certainly didn't support the obstacle very hard, but really? In the next jump sequence she had another runout. Diane Fyfe Something about the standard ring at the Rose City Classic really spooks Bossa. She rarely Q's there. Indoors on dirt 32.25 (SCT 41) Fourth run of the day, but first in the jumpers ring, Bossa wasn't real happy with the footing. Not fast, but a good finish to the weekend. Zach Davis 49.60 (SCT 76) A really nice run, but Bossa slipped on take off at jump 2 and dropped the bar. She had two prior runs in this ring with no bars down... this felt like a fluke. Susan Leitner A nice T2B Q to start the day, and then a good run in Premier Standard spoiled by me pushing her into the wrong end of a tunnel. 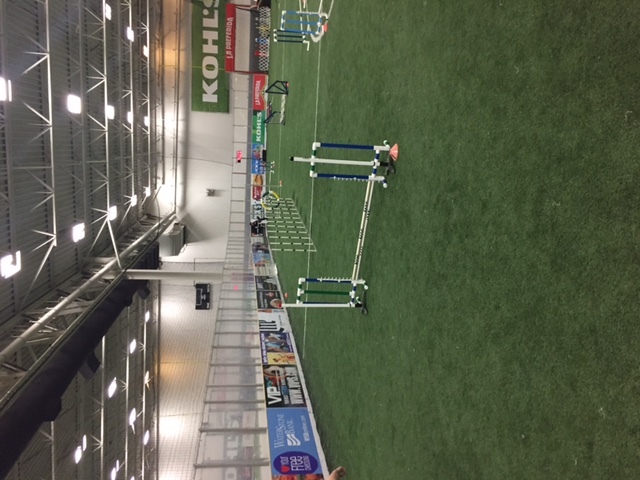 Bossa competed at the AKC Agility Invitational and recorded a 5-point Q in T2B to warm up, two clean runs, and two runs each with a single fault. She won the medallion for Top Dachshund. Video: Bossa's second run and her final run. 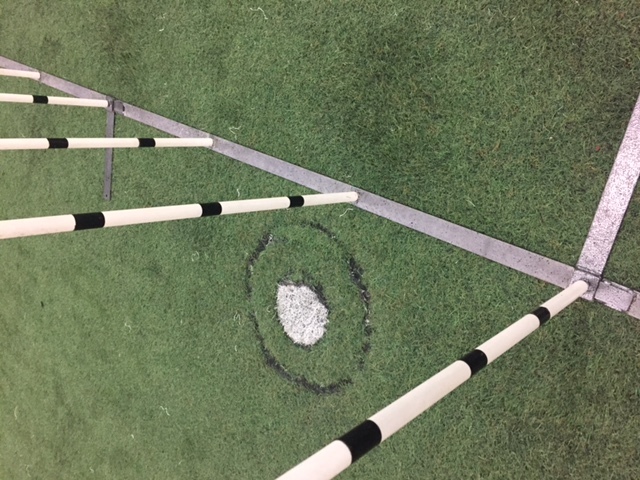 Indoors on turf 38.01 (SCT 49) Great line and jumping, but a penalty shot dot just off the weave poles caused her to break stride and miss a weave pole. I was ahead of her, should have supported more. Re-did them (practice for AGI). John Senger 56.40 (SCT 73) This time there was a paint stripe crossing the weaves at the 9th pole. I knew lots of teams were having issues here, and I tried to support it, but she still popped (did I break stride too?). Redid the weaves just fine. Oksana Syrkin My bad for not noticing the potential distraction on the jumpers course. Great Premier Jumpers Q between JWW and STD. Indoors on turf 34.52 (SCT 53) After a nice run in T2B, this was a good smooth run. Bossa's jumping looks good on the level soccer turf. Oksana Syrkin 50.74 (SCT 75) Aside from a hard call off after the dog walk (running contacts aren't all sunshine :) ), this was a really nice run. Great contacts. John Senger A trip to get Bossa used to flying to a trial, and to run on turf like the Invitational next week... nice result! Indoors on dirt 33.67 (SCT 50) A nice run, really in sync the entire time. Excellent line throughout. Susan Leitner 49.90 (SCT 71) A shrill dog bark just outside the ring caused Bossa to whip around and balk at the table. I would have called an R, but no call. Out of sync coming off the table. Candy Nettles Diane thinks I should be praising Bossa more on course. Tried and that worked well on JWW course. Indoors on dirt 35.08 (SCT 48) Bossa seemed a little rusty jumping, but her cautious approach left all the bars up. Great attention. Dan Faulkner 45.09 (SCT 69) Good contacts, cautious but good jumping. Carried a bit much speed in the weaves but fought to stay in. Really nice first run after five weeks off. Art Brest Nice to get back to running agility with Bossa after a long stretch of travel. Indoors on dirt N/T (SCT 49) Early on Bossa caught scent of the Barn Hunt right outside the ring and stopped. The second time she caught scent and stopped, I picked her up. Too bad - it was a good course for us. Abbie Hansen 54.39 (SCT 76) A little rusty, Bossa took a while to get comfortable with the footing. Good contacts, although a bit of a bounce off the teeter. I need to give her good exits even when turning off the board. Karen Wlodarski A really long break between competitive runs, between travel for work and Bossa coming in season. We were both rusty. Indoors on dirt 32.85 (SCT 50) A solid run including a tricky weave entrance. Mostly good line, although wide towards the tunnel at #14 (I really didn't cue the turn well). Laura Kuterbach 46.62 (SCT 74) Good contacts, although almost flew off the table. A nice line on a course that was straight forward for the smaller dogs (but trappy for the big dogs). Laura Kuterbach Whimsey has moved to 4", leaving us with less competition in the 8" class. Indoors on dirt 31.64 (SCT 46) Bossa wasn't 100% happy with the jumping surface, but ran a good line and really fought for the weaves. Susan Leitner 43.85 (SCT 70) Even though we didn't work on our issues between trials, Bossa's weaves and table were excellent. Nice contacts. Susan Leitner Our last day to trial before the end of Invitational qualifying (John was judging Saturday and Sunday). Indoors on dirt 31.58 (SCT 45) Nice run, but felt a little slow. She was being very careful with her jumping, squaring up to some of the slices. Talked to Bossa through the weaves (after what happened in standard). Lisa Potts 47.28 (SCT 75) Dropped into a down before the table before popping up and getting on (we had been practicing down a lot). Popped out of weaves at pole 10 - couldn't see why (but the surface was NOT good on this tall to small order). Outdoors on grass 33.33 (SCT 46) A comfortable Q, although Bossa wasn't running (or jumping) as fast in the thick grass as she does on dirt. Candy Nettles 50.39 (SCT 72) Bossa was taking the jumps very carefully, but turned in good contacts and a decent line. A little hesitation getting on to the table. Not her fastest performance, but we were looking for clean and got it. Candy Nettles It was nice to come back after yesterday's performance and get another double Q.
Outdoors on grass 30.09 (SCT 43) Not a bad run, but Bossa followed her nose on a sent out of the weaves at pole 9. She had dropped her nose in Premier too, but stuck that out for a Q and first place. Candy Nettles 47.52 (SCT 70) Looked good for her fourth course of the day, but was too fast in the weaves and missed pole 10. She fought for it, but just couldn't do it. A little hesitation getting onto the table. Indoors on dirt 33.15 (SCT 49) There were a few challenges on this course, but Bossa handled them well. The first bar, not so well, taking off very early and landing on the bar. (We weren't the only dog to drop that bar). Susan Leitner 38.15 (SCT 74) I thought we were third dog on the line, but as we walked into the arena they called for us. Straight to the line and go. Bossa was distracted at the table, but good contacts. Mary Mullen In Jumpers, a little depression before the start may have made it look like the bar was rising/getting close. Indoors on dirt 31.54 (SCT 45) Another tough weave setup (tough entry and 135 turn on the other side to the next obstacle), on a course that had plenty of challenges. A little wide at points, but a good run. Video 43.72 (SCT 73) A moderately tough course with a really hard weave entrance, we were in sync the whole course and nailed it (beating Whimsy on time). Indoors on dirt 31.78 (SCT 47) A nice clean run as we really focused on getting a double Q today. This course was really tough for the large dogs. Video 44.29 (SCT 69) A good run with a solid weave entry, good contacts, and mostly a good line (a little wide at a few points). Nice serpentine late in the course. Video Once again, we were focusing on being clean on day one of a trial. Just behind Cleo in each run to take P3. Indoors on dirt 30.34 (SCT 50) Both Bossa and I were a little hot for this run and I rushed a rear cross, pressuring her to drop the bar. Later took wrong course on a tunnel entrance, but maybe for lack of effort/focus at that point. Dan Butcher 44.56 (SCT 76) A pretty nice run on a course with some tough angles, Bossa took off high in the yellow from the A-frame (with tunnel entrances right in front of her). Otherwise smoking fast. Art Brest Need to keep working on staying connected and gauged on all runs. Really great K-turn on the jumpers course. Indoors on dirt 32.33 (SCT 50) A really nice course for us, without much wasted yardage (wide a little here and there). Bossa wasn't 100% comfortable with the surface. Art Brest 43.15 (SCT 73) We really focused on a clean run for our first run of the weekend. Great contacts. My pace was well gauged to Bossa's line. We arrived late and only had 2 minutes of walk time. Dan Butcher Making an effort to Q at the start of the weekend was effective. Both of us were calm and confident. Indoors on dirt 32.84 (SCT 47) Bossa was being careful with her jumping but had a decent line. We were nicely in sync the entire run. Craig Jossling 46.92 (SCT 74) Once again good contacts, I was able to get in a front cross at the bottom of the A-frame without pushing her off - a first. Tentative jumping. Craig Jossling Second day success fits the pattern that Diane has inferred. Nice to see a double Q again. Indoors on dirt 30.17 (SCT 47) Still not perfectly in sync, but a good run. I gauged my movements to Bossa's pace better on this run than in standard. Craig Jossling 49.82 (SCT 75) Good contacts, and Bossa was really flying, but I didn't hold up at the weaves and she entered at pole 2 (really tough entry). Later knocked the closing bar. Craig Jossling Diane has a theory that Bossa has problems the first time back to a site, and this first run in standard didn't disprove that. Indoors on dirt 30.99 (SCT 50) Wide at several points on what should have been a nice course for us. Bossa and I were a bit out of sync today. Debby Wheeler 41.60 (SCT 70) A really late front cross crowded Bossa and she dropped a bar. On video review, it looks like she missed the dog walk contact again. Ronda Bermke A bit better after a day of obedience and rally. Too fast into weaves in premier standard, and took a hard W after dog walk. Indoors on dirt 33.36 (SCT 53) A pretty nice run, but Bossa took off rather early on a slice jump, dropping a bar. Saw several dogs drop that same bar. Debby Wheeler 48.69 (SCT 75) Bossa took a wrong course after the weaves, way off the beaten path. Missed down contact on dog walk later (I was away laterally). Ronda Bermke Bossa seemed really distractable, looking for extra stuff to do on course. Nice Premier JWW run later - first place! Indoors on dirt 34.47 (SCT 47) Really sloppy - Bossa missed a cue for a post turn and went super wide, but mostly I was just a mess of a handler. I even got briefly lost at one point. Lucky to Q here. Art Brest (design) 42.73 (SCT 70) First run in a couple of weeks, and we were pretty rusty as a team. Bossa missed the dog walk contact by a mile, and dropped a bar when I did a late blind cross later. Art Brest My handling was really bad - my mind was more on various repairs that the van needed and not in the game. That doesn't excuse the dogwalk though. Indoors on mats 30.37 (SCT 44) No drama, just solid jumping and a good line for Bossa's first MACH. Bossa and Olive stole a bag of treats about an hour before this run ... the warm up jump was as much about learning how to jump with a stuffed tummy as anything. 44.81 (SCT 72) First run of Sunday. Scary, on the edge of control. Wide at several turns (on a forgiving course). Great contacts and table, super weaves. Happy to get a Q. It means so much to me to have Scott in the ring when Bossa earned her MACH. Scott was my mentor as a provisional judge. Indoors on mats 35.49 (SCT 49) A bit of heartbreak on the second run of the day - Bossa was distracted by the cheering for the dog before her and broke her start line stay, leading to several runouts and wrong courses in the early jumps. The last two thirds of the course was well run. Fingers crossed for tomorrrow. Scott Stock 43.16 (SCT 69) Bossa looked strong on this course after a complete meltdown on the earlier premier standard run (her re-introduction to the venue - "hello that round thing is called a TUNNEL"). Video It's hard to tell whether this is just stress down the leash (people who know me said I looked really nervous) or if the crowds were bothering Bossa. A bit of both, but I was definitely stressed. Indoors on dirt 29.65 (SCT 50) After the NQ in standard, we ran jumpers with a little anger and took a good first place. Lavonda Herring 46.36 (SCT 74) There were a few areas on this course that I was worried about, but A-frame to tunnel wasn't one. Bossa charged straight ahead, running for an oblique dog walk rather than taking the closer tunnel, earning a runout. Paula Ratoza A bit of a bummer on Bossa's first shot at MACH, but now I've learned not to take any obstacle for granted. Indoors on dirt 35.69 (SCT 52) Once again, our line wasn't super tight, and that was probably the half second to first place. I should remember to talk to her when I need to on the jumpers course. Right now we're going for the Qs, so I'm not worried. Paula Ratoza 43.31 (SCT 74) Obviously no issues from yesterday's teeter. I went to the wrong side of jump 2 (nerves?) but we recovered for a fast, clean run. A little slide on the table. Lavonda Herring Olive had a really nice standard run to start the day. I'm trying to keep a clean line and be patient - no need to rush right now. Indoors on dirt 32.15 (SCT 52) Bossa was awesome, but I briefly lost track of where we were at the end of the weaves and so our line wasn't quite as good as it could be for the next few obstacles. That might have been the difference to first place on this run. Lavonda Herring 44.96 (SCT 71) A fairly straight forward course, mostly good line but we could easily have run a few seconds faster. This was a new teeter for Bossa - lots of dogs reacted badly to it. Paula Ratoza Major props to the club for having a food vendor - excellent BBQ. Bossa continues to run well at Argus. Indoors on dirt 31.51 (SCT 51) I had just finished talking through what I saw as the challenges on the course with my instructor when I left early from one of the biggest challenges, leaving Bossa to take a wrong course. Totally handler error here. Lori Sage 42.77 (SCT 76) I knew from the moment that I saw the map that this was a good course for Bossa. Solid contacts, good jumping, and fast. Great job, Bossa! Lauren Duckworth Our run of double Qs had to end sometime, but major bummer that it was a handling error (and worse, impatience) that caused the fault. Bossa was really strong all weekend. Indoors on dirt 32.15 (SCT 51) I felt like I was behind and so I didn't try a front cross that I wanted... Bossa's line was wide as a result. Otherwise a very nice run. Lauren Duckworth 41.62 (SCT 73) Ran without benefit of a walkthrough, and a little rough at the trickiest point on the course. Bossa was fired up and flew through the course. Lori Sage We've been off for a few weeks (work travel) but Bossa hadn't missed a step. Indoors on dirt 30.68 (SCT 46) A tricky course but one that fit our skill set well. Once again, Bossa turned the wrong way on a post turn. We need to fix that! Dale Mahoney 43.10 (SCT 70) Turned the wrong way on a post turn, but I knew that was a possibility and walked my response. Great run. Jan Skurzynski Aside from the post turns (turning to the right but Bossa reads them as rear crosses), we're working very well as a team. Indoors on dirt 30.74 (SCT 44) A shorter course, good line except for one very late front cross on my part. Bossa looked very conservative jumping. Candy Nettles 46.63 (SCT 76) Smoking hot run, a little wide when she headed towards the wrong end of a tunnel, which was probably the 0.08 difference from first place. Amazing weaves. Rod Ramsell More often than not these days, problems are from my handling, not from Bossa's performance. Go Bossa! Indoors on dirt 34.49 (SCT 52) A little wide at 17, where I was afraid to get too much in her face at the risk of dropping a bar. But mostly a good tight line. Just slightly slower than Whimsy. Wendy Pennington 44.75 (SCT 74) All in all a nice run. Running small to tall so the weaves weren't too chewed up... Bossa was a lot faster than last week when she had to fight for the poles. Again several hard call offs from options. Lori Holdren I wasn't as jittery as last week, and we ran a lot more smoothly. A good pair of runs - Bossa is looking really solid. Indoors on dirt 32.65 (SCT 50) First run after a long break, and I was more jittery than Bossa. Her jumping was good, and we mostly had a tight line (wide at a few places where my handling was off). Dan Butcher 42.02 (SCT 70) Fantastic contacts and altogether solid jumping. We were much more in tune on this course although I did have to do several hard call offs from trap tunnels. (Whimsy took a wrong course, leaving us the blue ribbon). Zach Gulaboff-Davis The surface was nice for running and jumping, but the weaves were really chewed up (tall to small order). Bossa really fought through them on both courses. Indoors on dirt 34.47 (SCT 51) Bossa looked better jumping on this, her fourth run on the weekend. She seems to have figured out the sight lines and the surface. Turned the wrong way on a post turn, but I covered for that. Paula Ratoza 42.81 (SCT 69) Not quite as good a teeter as yesterday, but still a very nice performance, keeping all the bars up. Bossa continues to have great weaves. Jim Primmer What a nice pair of runs to close out the weekend. Indoors on dirt 32.65 (SCT 48) Bossa never seemed to have a good jumping form, checking up several times before jumps. On the second to last jump she checked early, took off way early, and crashed the bar. Jim Primmer 46.45 (SCT 75) Fantastic contacts, including teeter. I was very late on a front cross as was in her space, causing her to drop the bar. This was entirely handler error. Paula Ratoza Sad not to have any Qs or points to show for a nice pair of runs. Bossa was not confident in her jumping all day after the bar in standard. Indoors on dirt 31.68 (SCT 45) A really smooth performance. If anything, a little too tight at one point on the course. This was a pretty easy course for the small dogs. Jack Cadalso 47.87 (SCT 75) Two hard call offs, one after giving Bossa tons of praise for sticking with the teeter (this was the teeter that she really hates). Really nice contacts. Jack Cadalso I'm really proud of Bossa for sticking with the teeter - I stayed right with her, and that helped. outdoors on grass 35.09 (SCT 54) A long course with a number of twisty bits separated with lots of running. Bossa tapped bar 2 pretty hard and was more cautious for the remaining jumps. Courtney Moore 45.39 (SCT 75) Bossa likes these contacts, and turned in a good run. Could possibly have been tighter through a few sections, but all in all a great run. Courtney Moore Nice to get back in the Q column for standard again. First place in both cases was papillon Whimsey. outdoors on artificial turf 29.87 (SCT 47) Even though the temperatures were up a bit from the morning, Bossa continues to love jumping on this surface. Lavonda Herring 44.67 (SCT 76) A fantastic run but Bossa balked at the teeter (after doing it in T2B). This is the same equipment she didn't like in Elma back in January. She ran the rest of the course clean and fast. Abbie Hanson A long break as we packed up and moved to a new home. Bossa had a great run in T2B to start the day (4th fastest all jump heights). dirt under cover 36.21 (SCT 46) A twisty course on very loose, dusty dirt. Bossa took a nice line but was very careful with her jumping. Jean Munger 51.16 (SCT 75) Back on familiar contacts, Bossa was happy to do all the obstacles. Knocked a bar racing to catch up to me in a stretch where I was too far ahead. Also a little high on the A-frame dismount (but in the yellow). Tom Slattery A little time off, a familiar environment, and familiar equipment was good for Bossa's confidence. Also picked up 8 T2B points in the morning. indoors mats 33.89 (SCT 47) A nice start to the day, Bossa seemed really confident on the course. Great line. Ronda Bermke N/T (SCT 70) Bossa seemed good going in to the ring, but at the last second ran out the dog walk (#2). She came back to do it, but then two obstacles later ran out the A-frame. Brought her back to the approach and she just stopped. Picked her up. Ronda Bermke Not sure if this was a physical issue, not liking the contacts, not liking the environment, or a combination. Hopefully this doesn't carry over to other sites. indoors mats 35.22 (SCT 47) For Bossa's second run, she was cautious with the footing but ran a good line. Clearly still not comfortable with the surface. Ronda Bermke 60.01 (SCT 73) Bossa was cautious with the dog walk, and then later ran out the teeter. She did come back and do it, but then ran out a later jump too. Ronda Bermke Bossa's first time at an indoor training center. The environment definitely spooked her a little, and the contacts felt light. Candy Nettles 50.00 (SCT 76) A little wide at a couple of points, but excellent contacts, table, and jumping. A really nice second run. Candy Nettles A little warm out, Bossa didn't seem to notice. The surface was excellent short grass. dirt 31.75 (SCT 48) A lot of tight turns on this course, but Bossa ran a really tight line. Good time even though she was still being careful with jumps. Lavonda Herring 48.66 (SCT 76) Altogether a very nice run - good contacts, great weaves, and a good line. Placed 6th of 14 qualifiers. Mary Mullen Another solid pair of runs. Surface and temperatures were both nice. dirt 39.70 (SCT 54) A fair number of tricky angles but we were in sync as a team and looked good. Bossa may have been more cautious with her jumping, which helped. Mary Mullen 47.30 (SCT 75) Mostly a flowing course for the little dogs, we were a little wide at a few points. Great contacts, great attention. Lavonda Herring We had to restart on the jumpers course, the first time Bossa has experienced that. She reacted well. patchy grass 37.56 (SCT 49) This should have been a great course for our handling skills, but Bossa's nose was in gopher hunt mode the whole way. Amazing she kept bars up! Courtney Moore 47.49 (SCT 72) Some tough angles, hard weave entrance, and lots of options in Bossa's face. She dropped her head to hunt a few times, but stayed clean. Laura Finco Bossa's jumping was confident on the mix of grass and dirt, but the gopher mounds everywhere were hard to ignore. dirt under cover 35.89 (SCT 50) A course that didn't give a lot of space for forgiving mistakes, and when I didn't cue a post turn very well, we had to fight to stay on course. A little hectic for a bit, but we recovered better than last week. Debbie Wheeler 50.53 (SCT 75) The line on this course was rather sweeping even though it was fairly trappy. Tough fast weave entrance. Bossa really turned in a nice performance, half a second faster than the second dog. Cynthia Tilly Once again Bossa was cautious with jumps, checking up often on the jumpers course. The surface was much better than two weeks ago. grass 38.42 (SCT 52) A nice second run of the day, Bossa was handling the tricky bits with a nice line. But three jumps from the finish she wrapped the far post when I wanted a post turn. That put us on a rough line for the finish double, which she dropped. Sheyla Gutierrez 50.93 (SCT 76) Bossa dropped her nose hard at about pole six in the weaves, but didn't move. I was able to get her attention and back into the weaves in order, saving a nice run. Great contacts. Wendy Pennington Bossa looks so much better on grass than on dirt, although the scents in a park setting are dangerous. My warm-up routine might not have been strong enough on focus. dirt 39.99 (SCT 47) Bossa was looking good on this course, keeping a pretty tight line, but slipped at pole 7 and skipped one weave pole. The surface under the weaves was very loose dusty dirt. Kay Vonnahme 45.66 (SCT 73) The options on this course were pretty far, so we really focused on clean obstacle performance. A very nice run. Art Brest Nice to be back competing after a several week pause while Bossa was in season. It was about 90 degrees today, and the dirt was really soft. grass 30.60 (SCT 49) Took off way too far on a jump I was trying to get her to 'dig', and landed on top of the bar. Otherwise a very impressive run. Debby Wheeler 45.66 (SCT 75) A really good looking run, but half way through the weaves she dropped her nose and started hunting. Impressive because she had entered well and was weaving at full speed! Debby Wheeler A couple of tough breaks today. Saw several dogs break weaving and sniff on the standard course. Oh well. Note: Bossa came in to season three days later. grass 32.02 (SCT 50) Second run of the day, and another very nicer performance. Noticed on the tape that she is jumping early when approaching jumps on a sharp angle. Debby Wheeler 46.61 (SCT 75) Nose dropped at a few points on the course, but her obstactle performance was solid. Nice contacts, table, and weaves. Took off early for a slice jump, barely bringing the bar down. Debby Wheeler It was nice to be back running agility after time off for travel. Bossa didn't seem rusty. Laura English 48.95 (SCT 74) Bossa looked solid on this course, doing all the handling parts well, but curled towards me at the weave entrance for no visible reason (she came back and did them well). Later she took off early and hit the top bar of the triple. Mary Mullen Bossa warmed up well and was very responsive on course. I was surprised by the errors on the standard course. dirt 36.95 (SCT 55) One of the toughest courses we've seen in a while with a lot of in-your-face options. Didn't really get a tight turn on a "dig" at jump two, but otherwise Bossa looked awesome, keeping a tight line. Terry Elger 47.66 (SCT 73) I was too far ahead of Bossa at the teeter and she stopped to confirm that I wanted her to do it, earning a refusal. Did the teeter with no issue after the second command. Otherwise an excellent run. Craig Josling The condition of the dirt at Industry continues to be excellent. I'm sure the wet weather is helping. It was really good to see Bossa continue clean after the teeter bobble. dirt 37.79 (SCT 53) Absolutely beautiful run, technical start into a flowing fast finish section. Great jumping by Bossa. Robin Veenema 50.81 (SCT 73) A great run (although a little wide on a 180 after the chute). Entered the weaves at pole 2 after a wide turn off the A-frame. We were happy to see nail the teeter here after the last two R's. Robin Veenema Bossa NQ'd in T2B after popping out of the weaves twice at pole 9, and then another R at the teeter. dirt 32.44 (SCT 48) Bossa's second run here, and she was happy to just be jumping. Good clean line, very responsive run. Robin Veenema 49.85 (SCT 68) Pulled out of the weaves at the last pole as I stepped forward for a cross. Took an R at the teeter, but then got on for an ok performance. Robin Veenema A smooth dirt surface (after some raking). Bossa didn't seem to like the feel of the contacts here. dirt 31.37 (SCT 45) A really tight clean line. Bossa looked really good jumping, taking the inside of almost each bar. She was still being careful with the jumping, so a little slower, but nice runs. Abbie Hanson 48.53 (SCT 72) I was really sloppy with a front cross before the A-frame and Bossa read my handling to take a wrong course. Looking at video, she was right. Bad handler! Otherwise a really beautiful run. Kitty Bradley The surface was even better than yesterday. Very level and good traction. Bossa loved it. dirt 34.58 (SCT 48) A fairly tight and twisty course with a tricky weave entrance. Bossa was very controlled and ran a very nice line. A little wide at one point, but altogether a very nice run. Kitty Bradley 49.76 (SCT 73) This course was loaded with options in the dogs face, but Bossa did a great job sticking with me. I was too far ahead in a jump sequence leading to a rear cross, and got stuck behind the wing. Bossa back jumped. Definitely handler error here. Abbie Hanson The surface was the best we've seen at Industry in a while. Bossa was still careful with her jumping. dirt 38.65 (SCT 51) The surface was much improved today, but Bossa still took a lot of care with her jumping. Didn't even look at the trap tunnels - she's reading my body language really well this weekend. Tom Slattery 48.59 (SCT 68) The dog's line on this course was a little choppy with several hard 90 degree turns, but Bossa read my handling cues well. A little slower than usual in the weaves (at obstacle 2). Alan Arthur We're definitely working better as a team. Bossa is reading decel cues very well, and is being very responsible with her obstacles. dirt 38.79 (SCT 50) The footing in the jumpers ring was a real mixed bag - hard and mostly flat in places, very pebbly in others. Bossa wasn't comfortable with the surface and checked up before almost every jump. Alan Arthur 50.76 (SCT 76) A little wide at one tricky turn, and not a very confident teeter performance, but still very impressive. Tom Slattery I tripped myself just before the second teeter in T2B and that freaked Bossa out a bit. I think that affected her standard teeter performance. dirt 32.23 (SCT 45) A fairly straight forward course, but we chose to use rear crosses instead of fronts... that worked well today. Very nice, steady work by Bossa. She's adapting well to the conditions. 48.50 (SCT 71) This was a very tricky course, but Bossa looked really solid throughout. Used a nice serp+blind move in a 270 and Bossa read it perfectly. Bossa's attention and focus was excellent today, and she really took care of her jumping. dirt 34.08 (SCT 48) A lot of tricky angles on this course, but Bossa was very responsible with her jumping. A little wide at a few points, but a good performance. Laura English 52.03 (SCT 76) A really great run, but I put pressure on Bossa as we approached the table. She hopped on and then right off again in the direction of my motion. I stopped up in the yellow of the A-frame and dog walk for turns, Bossa took off a little high in both cases. Peter Liu Bossa was being very cautious with her jumping. The surface was very pebbly, making footing difficult for smaller dogs. grass 38.55 (SCT 49) I used a blind cross mid course and she used the short break in contact to take an obvious tunnel trap before I could call her off. Fought for the weave entrance but broke out at pole 8... probably still thinking about the wrong course. Wendy Pennington 45.67 (SCT 74) A lot to like in this run. Good jumping, nice contacts and table. And really fast. :) The surface wasn't the best (dry grass), but her focus was excellent. Didn't even drop her nose at gopher holes. Wendy Pennington Another break for work, and again Bossa was amped to return. I look forward to seeing how she does when we compete more regularly. And to seeing live grass when El Nino hits. grass 31.72 (SCT 46) The footing wasn't very good on the dry grass, but Bossa took her jumping seriously and ran a nice tight line. Craig Josling 47.56 (SCT 76) One of Bossa's best standard runs, and the first time she's completed a standard course at this site. Great contacts, but slipped between weave poles four and five (loose dry grass) and missed a pole. Jacqui O'Neil After a month off, it was nice to see two very nice performances. So very close to a double Q! By the way, it was HOT out. grass 35.44 (SCT 49) Bossa's attention wasn't as good today, she even turned to chew on her rear when I left her. A good run, although a little wide at a couple points. Diane Fyfe 45.20 (SCT 74) Bossa was looking distracted, and didn't go into a down on the table (her criteria). I didn't slow up heading into the weaves and she missed the first pole. Really need to work on that. Diane Fyfe Again a nice pair of runs, although Bossa's focus wasn't the best. grass 32.17 (SCT 48) A little wide in a turn near the finish, but otherwise a nice solid run. Very attentive. Excellent weaves. Bossa really looked happy to be back on grass. Diane Fyfe 45.86 (SCT 71) A nice tight turn at the start of a tricky course, excellent contacts, great table performance. Bossa looked super confident and we looked like a team for the first time in standard. Diane Fyfe On the hot side for San Diego (mid-80s), but the surface was excellent for our first Double Q! dirt 41.42 (SCT 54) Still not comfortable with the surface, Bossa was being careful on jumps. Locked up and stared at judge mid-weaves (I thought I heard a "snap" sound). Finished them and got back in the green. John Defillipi 50.17 (SCT 75) Excellent performance all around, but I didn't decel heading into the weaves (straight-on with speed) and Bossa entered at pole 2. That's a hard entrance that we need to practice more. Scott Stock Temperatures were much nicer than last weekend, but by the end of the day it was still getting warm. Surface was still pretty poor. dirt 35.94 (SCT 46) Bossa was really attentive outside, and in, the ring, but she was not comfortable with the footing. I worked hard to stay even so she didn't race, but she just couldn't keep the triple up. Laura English 60.74 (SCT 76) This was one of Bossa's best looking standard runs in a while. Very focused, tight line... except that I took my eye off of her during a front cross off the A-frame and she missed the next obstacle (chute). Don Wittke This was the coolest day of the weekend trial, but still very hot. The surface suffered, dry, deep, and hard to run and jump in. Bossa is SO close to turning in a double Q.
grass 35.05 (SCT 49) Bossa seemed a little distracted throughout but did nicely on a course with a lot of tricky handling. Lost focus over a wrap jump and crashed the bar. About as good as an NQ could be. Mary Mullen 50.22 (SCT 76) Once again a problem getting on the table, but today was just a short hesitation and a little turn back. She's doing better each time, and continuing on to run the rest of the course well. A little retraining of the table is next. Geoff Teare Conditions weren't much better today. Two very nice runs, even considering the faults. grass 35.27 (SCT 49) Bossa was running well but brought a bar down mid-course, and then I pulled up at the finish jump and she brought that bar down too. Nice response to my handling otherwise. Geoff Teare 50.76 (SCT 76) Really nice performance except that she dropped into a down before the table. It took a few seconds to get her up onto the table, but not as bad as our last outing. Mary Mullen It was incredibly hot out, around 100, and the grass was very thick. Great performances for tough conditions. grass 36.65 (SCT 51) Bossa seemed a mix of concerned about the crowd and dogs outside the ring and very careful with her jumping. As a result, she wasn't very fast. Bob Jeffers 59.71 (SCT 76) Crashed through jump three, and clearly it bothered her. She stressed and refused the table, although she eventually got on (probably lost 12-15 seconds). Bob Jeffers A long day with a lot of waiting around. There was a LOT of public ring side. grass 45.50 (SCT 50) Bossa was sniffy at the warmup jump and kept being pulled that way. Popped out of the weaves (on that side of the ring) at pole 8, did them perfectly the second time. I told her "left" on a rear cross and she cut too hard... I should let the body language do the work. Jacqui O'Neil 45.54 (SCT 73) Finally back in standard, and Bossa was in top form. Great contacts including her new teeter performance. I was really proud of her today. dirt 30.00 (SCT 46) Still wide on some of the turns, but Bossa seemed more comfortable with the surface today. We arrived late and didn't get to walk the course! Beverly Morgan Lewis We spent the morning working and cut things a little close - they were already running 8" when we arrived! dirt 37.38 (SCT 50) A little wide at points, but a nice first run after a break. Bossa missed the entrance to the weaves, and it's not clear why, but she did the entire set the second time. Missed a "dig" cue at the end. Nancy Kemna A good performance - the weaves were near the rear of the ring, which was a solid wall (for the motorcycle races). dirt 29.25 (SCT 44) A nice controlled run, Bossa's jumping looked smoother than yesterday's run. A little wide at a rear cross (I over-handled). Just out of the placements behind the super fast papillons. Scott Stock Bossa seems to think that she should be doing more agility... she'll be hungry for Standard when we return. dirt 30.79 (SCT 45) Aside from a couple of wide turns this was a really nice performance. Bossa didn't seem happy with the surface at points, but kept the bars up and turned in a competitive time. Dave Hirsch We're working on re-training the teeter using criteria similar to Sharon M and Gee!. Until Bossa (and her handler) show strong performance in training, we're not running Standard. It was nice to see Bossa back in the Q column. We wanted to make sure she could have success in jumpers. dirt N/T (SCT 47) Bossa was acting distracted and sniffy but she usually turns it on for jumpers. Not today. She went to visit ring crew, popped the weaves, and blew me off when I went to pick her up. Extremely disappointing. Alan Arthur 47.39 (SCT 73). Our strategy was to just run past any obstacles that Bossa balked at, such as stepping off the teeter or stopping before the table. Bossa did everything else well, which was nice. Ronda Bermke Now that Bossa's stress is showing up in Jumpers, we're going to take a break. We skipped Sunday and withdrew from the next trial. grass 32.91 (SCT 46) Bossa was being careful with the jumps and I was trying not to race her... that got me stuck in no mans land when I needed a cross. The result was a wrong course, entirely my fault. Larry Brockett N/T (SCT 76). Just like last Sunday, Bossa did well on the opening but then she was heading to the table, which had the teeter behind it. Bossa stopped before mounting, and then turned and ran away (playfully). I had her stop and down to leave. Windle Ewing Bossa worked the teeter in class nicely. We need to see a course with a teeter before the table to know what is really wrong here. indoors on dirt 32.58 (SCT 45) Bossa knocked a bar hard in warmups and was very cautious on the course. Still she was fast enough to place, a nice way to wrap up the weekend. Blair Kelly N/T (SCT 76). Bossa handled a tricky opening sequence well, but after the weaves she was heading to the table, which had the teeter behind it. Bossa stopped before mounting, and then turned and ran away (playfully). I had her stop and down to leave. Bob Jeffers We definitely have a teeter issue. Hopefully she'll be happier with the equipment and venues back home. ps - At the hotel after today's trial, Bossa threw up most of the cheese and victory boxes from today. This weekend was probably a bit much for her. indoors on dirt 34.15 (SCT 53) A somewhat trappy course but Bossa was jumping well and had a nice line. Really nice to get back into the Q column - just half a second out of the placements from a class of 20. Bob Jeffers N/T (SCT 76). Houston, we have a teeter issue. After seeing a light, fast teeter in Virginia, Bossa was super careful on the heavy slow teeter here in Georgia. And today she bailed before getting to the yellow. I decided to take a whistle and put her back on... I had to literally put her on and have her ride it down. Lisa Dempsey Bossa hit a jump pretty hard earlier on the standard course but shook it off. She also won Reserve Winner in longhairs. indoors on dirt We drove down from Norcross in the morning, which meant that we missed the Jumpers run. We didn't even enter... saving a few dollars. Sadly we did blow off our Obedience and Conformation entries. 48.51 (SCT 74). A really good run, although Bossa was cautious on the teeter... at which point I chose to do a front cross almost pushing her off. But she was solid until skipping two poles in the weaves (the judge didn't notice) but then taking the trap jump after the weaves. indoors on dirt 32.83 (SCT 43) I caught myself racing ahead a bit at jump 5 and slowed, but Bossa read the speed change wrong and took off early, dropping a bar. Otherwise awesome run, great weaves, nice rear cross. Dave Mancino 54.73 (SCT 71). Bossa was great throughout but popped out at pole 10 of the weaves, away from me. I think she was looking at the back wall of the facility. First NQ in a while that wasn't a clear handler error..
Dave Mancino Even though we didn't Q this weekend, it was a great set of runs. Bossa still needs to learn how to regulate her jumping on dirt. indoors on dirt 36.19 (SCT 51) A tricky course, and Bossa mostly looked good but I left the second jump before Bossa had realized that I was going, and she took a wrong course. Otherwise nice run. Dave Mancino 42.56 (SCT 70). Great run but I raced ahead to get a serpentine and Bossa took off early to drop a bar. Dave Mancino A nice pair of fast runs with just single mistakes. Good dirt surface, but Bossa still doesn't trust dirt as much as she likes grass. grass N/T (SCT 48) Bossa was pretty excited for the first run of the day, but after the starting tunnel she ran straight to the far corner of the ring, blowing me and the weaves off. Picked her up. Rene Fitch 51.32 (SCT 76). One of the hardest standard courses we've faced in a while, and the run was on the edge most of the time. But the one fault was a hesitation at the table. Rene Fitch This was a new site for us - out in the open with a lot of activities around, bikes, dogs, soccer. grass 27.03 (SCT 46) Bossa looked so professional on the second run of the day. Heat doesn't seem to phase her the way it does Olive. Nice to pick up some points again. Peter Liu 45.83 (SCT 75). A few hard call-offs, and a ton of carry after the dog walk (making a wide turn), but a truly awesome run. Bossa's obstacle performance was excellent, but her line could definitely improve. dirt 30.44 (SCT 44) There was a long delay for the "go", and I didn't get Bossa's attention properly when I reset her. She wasn't paying attention (looking at the crowd?) and dropped the first bar. Otherwise a very nice run - supporting her jumping worked well, even with hard angles. Mark Upshaw N/T (SCT 75). A tricky course but Bossa was looking good (although Diane points out she was "running hot" after the table). Tried a front cross at the teeter end which pushed her to a fly off. She didn't like that and ran out the last two obstacles. Scott Stock Even though we didn't Q this weekend, it was a nice set of runs. I need to work on giving clear, early calloffs. And for now, avoid front crosses after contacts! dirt 35.26 (SCT 44) Nice handling but Bossa took the obvious entry to the tunnel for a wrong course (even with an RFP). Knocked a bar later (really soft footing at take off). Scott Stock 44.80 (SCT 69). This was a hard, tight course, and I was expecting a lot of problems. But the only problem was a wrong course to the A-frame. Really excellent run. Mark Upshaw We worked on jump chutes a bit this week, and Bossa seemed to do well with the odd, tight spacing in standard. grass 35.69 (SCT 47) Bossa seemed to be struggling with jumps, checking up, jumping high, or jumping early. Brought down the bar before the weaves, and then missed the weave entry (a result of the bar hit). Karen Wlodarski 46.02 (SCT 76). Yay! We finally put it all together as a team. Bossa was a little sniffy heading to the table, but got on and turned in a nice run for her first AX leg. Karen Wlodarski This is the fourth surface in four weekends - it may be that Bossa just doesn't know what to expect jumping on any of them. dirt under cover 33.54 (SCT 52) We looked better than our last outing, but the footing was pretty chewed up at the front of the ring and Bossa ended up jumping early on two jumps, dropping two bars. Laura English 57.06 (SCT 75). Wrong courses as Bossa missed the tunnel A-Frame discrimination both ways. Clearly handling was the issue the first time (bad line). Bossa also balked at the table, but got on with a second try. Fast and confident run, great weaves and contacts. Jacqui O'Neill Clearly Bossa didn't like the footing as much as the last two weeks. Sure would be nice to see an easier Standard course every once in a while! dirt under cover 33.81 (SCT 47) A really sloppy cross in the middle of the course brought a bar down. My handling was rather sloppy on this run. Otherwise a nice run, solid weaves. Kay Vonnahme 46.95 (SCT 76). My handling sent Bossa into the wrong end of a tunnel (the most common fault on this course). Otherwise beautiful - good contacts, table, and weaves. Courtney Moore I'm super pleased with today's runs. We no longer seem to be dealing with obstacle issues are and moving on to team work and handling. dirt under cover 33.08 (SCT 50) The spacing of the first three jumps was really long and Bossa mis-judged the takeoff for jump three, knocking a bar. At the weaves I stepped away early, pulling her out at pole 11. Courtney Moore 52.09 (SCT 76). Bossa didn't hear my "dig" command at a jump off a table and backjumped it. Did a great teeter, but I thought she was going to fly off, but when she didn't I took us to the wrong jump. Kay Vonnahme Once again, a really nice pair of performances, coupled with another 10 point T2B run. We're getting there... aside from the knocked bar, this was mostly handling issues. mats indoors 39.26 (SCT 49) The crowds were big and noisy for Bossa's jumpers run, and the environment was getting to her. Something spooked her at pole six of the weaves. We reset and she did the full set. Lisa Dempsey 42.99 (SCT 70). One of our best standard runs ever. All of the obstacles were solid, and only a little pressure from me in the weaves (I got ahead of her) caused an NQ. Ronda Bermke Even without a Q today, it was a really nice pair of performances. Bossa was really attentive all day. mats indoors 30.45 (SCT 45) Bossa's third run of the day was her best - great weaves, good line, feeling more comfortable with the jumping surface. 3/10 towards MXJ. Ronda Bermke 52.37 (SCT 76). Bossa was a little slower in the weaves on the mats that I expected and I got ahead of her, popped tenth pole. Then took a tunnel trap and knocked last bar. Still, a GREAT run. Good contacts, good table. Lisa Dempsey First place in T2B, really solid performance all day. I'm really pleased with her effort today. dirt 33.54 (SCT 45) The footing was much better today, but the course was really tricky. We were wide in a few places, and could probably have shaved three or four seconds off the run. Bossa's second Q towards MXJ. Scott Stock 45.58 (SCT 74). Bossa back-jumped an early jump in a 180. I suspect a combination of her being distracted and me being a little out of position. Otherwise a really excellent run - good weaves, good contacts, and good table. Dave Hirsch Lots of table work paid off - and I really celebrated with her on the table. This was a very promising pair of runs. dirt 38.80 (SCT 51) A very tricky course on loose footing. Bossa looked great - solid weaves, a rear cross - but took down two bars. From the video, it looks like she was jumping early when I was leaving for the next cross. Scott Stock N/T (SCT 71). I tried a front cross at the bottom of the dog walk that Bossa missed (but no fault, just wide). But at the table a few obstacles later, she just froze up in front. Picked her up. We have good video of the incident. Dave Hirsch We're training the table a lot before the next run on Sunday. Footing here isn't good, you can see her slipping both on the flat and when jumping. thick grass 28.70 (SCT 42) Really solid weaves, a little wide after a rear cross (!) but mostly a solid run for Bossa's first MACH points. :) Third place out of many qualifiers. Wendy Pennington N/T (SCT 75). A very tricky opening section, and Bossa was looking good. But I pushed her to pole 2 on the weaves entry. Then she balked getting on the table so I picked her up. She seemed happier not being allowed to run off like the last two times. Wendy Pennington Bossa was 2/3 today with a 10 point win in T2B. We need to work on her confidence in standard, but we're still very proud of her. 31.24 (SCT 44) A moderately challenging course for us, but Bossa was focused and looked solid. Tight line but not super confident jumping on the surface. Great weaves. N/T (SCT 76). Super run (very fast, like on the 13th) up until a late cross after the a-frame caused a missed jump. OK table performance (got on fast, but didn't do a down) but then ran off towards Diane. Obviously mistakes cause her to stress. Picked her up. Mary Mullen We need to figure out how to nip this issue in the bud. Any error seems to cause Bossa to go into avoidance mode later. We need the ring experience, but can't reinforce this behavior. dirt under cover 32.65 (SCT 49) A really nice run, great weaves, but Bossa was distracted by something, and my front cross was sloppy, causing Bossa to miss jump 2. A little wide changing direction out of a pinwheel - my cues must be a little slow. Mary Mullen N/T (SCT 72). Looked really good on the first half of a tough course. Got a little ahead at the table and turned to face her. She stopped short. From the table she ran straight to Diane, taping ringside, and from there to the judge, avoiding me. Picked her up. Terry Culley Blowing me off like that in the standard ring was pretty disappointing. Ran T2B to start the day, the surface was REALLY chopped up (tall-to-small) and she stumbled in the weaves. dirt under cover 34.57 (SCT 49) Fantastic run, a little wide at a couple of points, mostly where my turn/decel cues were late. Nice to get back into the Q column. Tom Slattery 48.30 (SCT 75). Bossa was on fire - really fast, excellent handling, although left the A-frame at the top of the yellow. Carried way too much speed into the weaves and couldn't make pole 2.
dirt under cover 41.86 (SCT 49) Good attention today. Dropped her nose hard at the fifth weave pole, then went to visit the judge. Also a runout at a jump that I didn't support well at all. Altogether a good run, even with the faults. Lavonda Herring 47.23 (SCT 74). Popped the weaves at pole 10 (not sure if I started to accelerate or if she did it on her own). Took off high on the dog walk. Great table, good attention. Alan Arthur 57.68 (SCT 72). Once again, distracted by the dog before her. We wonder if Bossa hasn't realized that other dogs also run agility. Runout (towards exit), table runout (towards exit), knocked double (looking toward exit). Jan Skurzynski 53.73 (SCT 76). Great run - solid weaves, great table, good contacts. But a late front cross at the teeter earned a runout, and dropped the triple when I was too far ahead and she was racing to catch up.
? (SCT ?). Bossa was fired up and running a lot faster than I've been expecting. Picked up a few runouts, mostly when my handling was way late. Did a down in front of the table. grass 35.36 (SCT 50). Popped the weaves at pole 10, with her head snapping to the left (towards the setups outside the ring). Really nice handling on a wide open course with some tricky side changes. Kitty Bradley 48.42 (SCT 72). One of the hardest courses we've run, with a lot of 90+ degree turns. Bossa looked solid, nailed the weaves. Early take off on the dog walk wasn't called. Flew off table, but that's better than a refusal! short grass 45.28 (SCT 44). Popped the weaves at pole 6 and took almost 20 seconds to get back on course (nervous sniffing). Good handling, and made all her weave entrances today, but need to work on finishing them. Dan Butcher 51.66 (SCT 75). A very technical course, Bossa handled the tricky bits well. Refusal getting onto the table, popped last weave poles (didn't fix). Solid contacts. dry grass 36.99 (SCT 47). A very technical course, very wide at a few points. Missed the weave entry but fixed it and turned in solid weaves. Dan Butcher 46.96 (SCT 74). Once again dropped the second bar on a leadout (at about the same spot). Popped out of weaves when faced with a c-shaped tunnel at the exit (and took the wrong end). Wide at several places. Excellent contacts and table. dry grass 41.07 (SCT 53). Bossa dropped an early bar, possibly due to my position on a leadout front cross. Later blew the weaves when I tried a very aggressive rear cross on the entry. Rene Fitch 59.26 (SCT 75). Faced with a c-shaped tunnel off the dogwalk, I overhandled and caused a refusal and runout. Distracted by dog outside ring. Course was built MUCH harder than map. Bad weave entry but then did them right. Excellent contacts and table. grass 30.93 (SCT 50). Even though it had started to rain and Bossa didn't trust her footing on the grass, a good clean run. Wide at a few points. Would have placed 3rd in Masters with 19 points.